A Book Forum on The Anti-Witch in Somatosphere (May 2016) is available here. The anti-witch is nothing short of anthropological therapy—it keeps the dream of ethnography as theory alive in these troubled times. 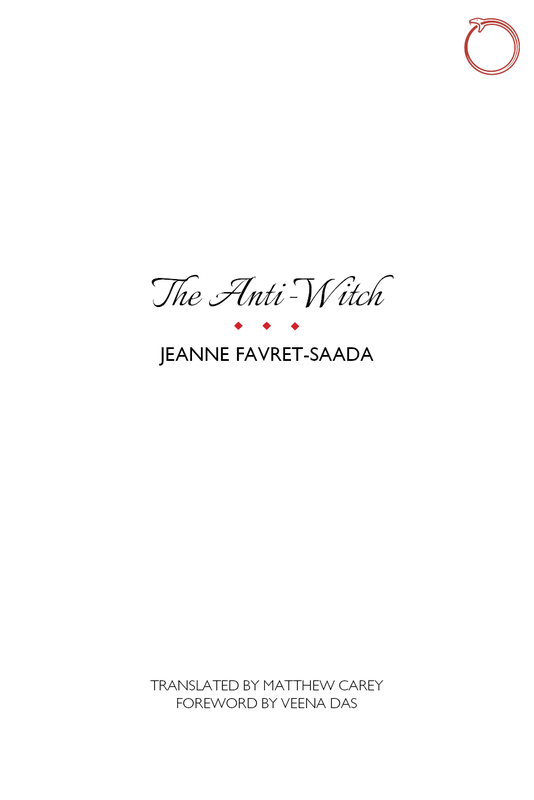 Jeanne Favret-Saada’s The anti-witch is a timely challenge to anthropology and ethnography that goes far beyond the study of “witchcraft.” Her view of dewitching as a therapy, through which the patient has to assume violence as a necessary element for regaining health and prosperity, highlights the worrying ambiguity of evil—a basic issue that makes witchcraft such a haunting theme in societies all over the world. A powerful book in its directness and depth. Rose Hunt, Nancy. “An Opacity, through Sallies.” Somatosphere Book Forum: Jeanne Favret-Saada’s The Anti-Witch, edited by Eugene Raikhel. 2016. The tone is charming. So are the tarot cards. A chapter with historical comparisons illuminates, as do the many perceptive gender and household readings. Mischievous is the endeavor as a whole. After all, it seeks to remake anthropologies of witchcraft and popular religion almost as much as ethnographies of mental health and therapeutic process. Favret-Saada goes far toward defining a new field in The Anti-Witch: an anthropology of therapies highlighting methods required with an openness to affect. She denigrates participant observation and empathy (as distance) along with their attention to representations and ritual, while instead promoting an ethnographic practice that involves digging in, merging with, and accepting forms of unknowing. Voss, Ehler. “Favret-Saada, Jeanne (foreword by Veena Das; translated by Matthew Carey). The anti-witch.” Journal of the Royal Anthropological Institute 22, no. 2 (2016): 452-453. Ioan M. Lewis suggests that anthropology is like a ritual, in which doing fieldwork results in a state of possession by something foreign and writing about it after returning home is a process of depossession. This book by Jeanne Favret-Saada shows a direct correlation between the strength of the possession and the length of the process of depossession. The anti-witch is the third book about her fieldwork on witchcraft in rural northwest France, conducted from 1969 to 1972. Deadly words (1977), her first resulting ethnography (which was followed by more diary-like ethnographic descriptions in Corps pour corps, 1981), aims – with a claim to be unique and with a healthy portion of aggression – to reinvent anthropology as well as psychoanalysis. Favret-Saada has been praised for her radical realization of the anthropological ideal to get involved in the field with the entire person, and to put aside the question of ontological truth in order to reveal the inner logic and functionality of local practices as well as how people get involved in these practices. She shows that witchcraft is something to be found not only in former times or alien lands, but also next door and these days. The advantage and necessity of fieldwork becomes especially salient in a field where everybody is cautious about speech acts, not only because words can cause harm and death, and witches can hear them over distances, but also because admitting to be involved in witchcraft exposes oneself to public ridicule. Favret-Saada provides a rich ethnographic description of the learning process on her journey, which extends deeper and deeper into the field until she is herself ‘caught’ (as the locals call their entanglement in witchcraft). Meyers, Todd. 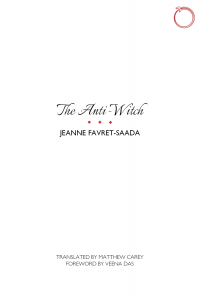 “The Anti-Witch by Jeanne Favret-Saada.” American Anthropologist 118, no. 4 (2016): 894-895. To appreciate this book is to recognize its context. Its appearance for French readers signaled the expectant return of a scholar who had taken different paths in the thirty-odd years since the publication of her Les Mots, la Mort, les Sorts (Deadly Words) (Favret-Saada 1980). The publication of Désorceler (The Anti-Witch) did not transform the terms by which anthropology worked, it simply brought together essays on witchcraft in the Bocage countryside from Favret-Saada’s 1969–1972 fieldwork, which had appeared in various forms from 1983 to 1991, with a “Prélude” written in 2009. Still, it was exciting to return to the Bocage––and, for some of us, to return to an author who drew us to anthropology in the first place. Favret-Saada synthesizes the blend of theoretical and methodological considerations clearly in saying, ‘My work on Bocage witchcraft gradually led me to reconsider the notion of affect and the importance of exploring it, both as a way of addressing a critical dimension of fieldwork (the state of being affected) and as a starting point for developing an anthropology of therapy (be it “primitive” and exotic or learned and Western)’ (p. 97). Indeed, Chapter VI, in total, offers a final and convincing salvo of The anti-witch’s primary proposition – that methods and theory cannot be easily or effectively separated. One cannot help but think that the turn toward psychotherapy in The anti-witch is not merely a reflection of Favret-Saada’s own intellectual predilections, but also an acknowledgement of the fraught relationship between anthropologists and the subjects (human and otherwise) of their fieldwork – the ways in which we must subject ourselves to a constant denaturalization of our own ideas and beliefs, of defamiliarizing the familiar, in order to understand, empathize and allow ourselves to be ‘caught up’ or affected by the words and worlds of our key interlocutors. In reconstituting our own identities and realities, we engage in a form of mutual creation and construction that can be both deeply unsettling and therapeutic in equal measure. It is this parallel consideration of the theoretical and methodological that makes The anti-witch both an enjoyable and an enduringly useful text. Luhrmann, T.M. “Terrified in Normandy.” Times Literary Supplement. September 30, 2015. Favret-Saada thinks about witchcraft differently. She sees these dewitchers as practicising a kind of therapy. She sees them as giving their depressed clients a new way of thinking about their situation, with new tasks to act on and new goals to focus on. And she describes the way these new tasks help them feel differently about their force and the world.